Status: Restoration completed in 2012. In showroom. 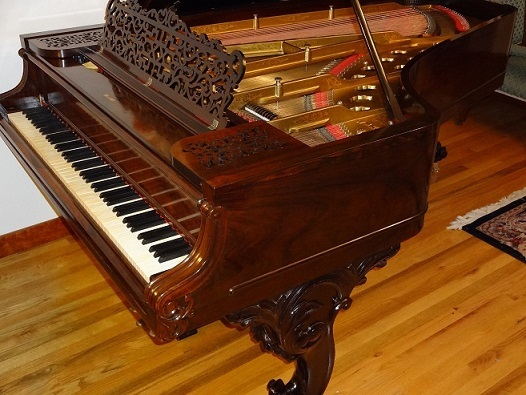 This large grand came to Historic Pianos in an unplayable condition in 2009. The main rosewood case was dirty and dinged, but still showed signs of beauty. However, the scrollwork on the decorative legs had been cut off and destroyed as rusting, industrial-style steel pallet casters had been installed, apparently in order to make the instrument move more easily on a stage. The hammers were worn beyond recall, the action was poorly regulated, the strings were corroded and "tubby" sounding, the decorative gilt and bronzed string plate was dirty and unattractive, and the soundboard was so dirty that the serial number could not be deciphered. The keyboard ivories were stained and damaged, and the action was sluggish and unresponsive. However, even in this state of disrepair, the sound was powerful and sustained, showing promise of the singing tone that great Knabe instruments were known for, and which made Knabe the official piano of the Metropolitan Opera for many decades. The restoration of this formidable instrument was completed in 2012. The legs were repaired, including the carving of new scrollwork on the legs, refinishing to match the original synthetic rosewood finish, and installation of appropriate, heavy-duty decorative brass casters. The original soundboard and bridges were repaired and refinished. The very decorative string plate was carefully restored to its original glory, complete with flower gold-paint decoration. The instrument was restrung with new steel treble wire, custom, properly scaled bass strings, and new #2 tuning pins that are properly tight and have excellent tuning stability. The original French polish shellac finish was repaired where possible, and reapplied where necessary, such as on the very decorative filigree music rest. The action was restored, including fitting of new custom Abel shanks and hammers from Germany. The keytops were cleaned and repaired, and the keyboard was restored with new bushing felts and releveled. The action was meticulously adjusted to proper balance and touchweight, and regulated to "better than new" specifications. The new hammers were voiced to a rich powerful sonority that quite striking from the deep bass to the high treble. The responsive action, long strings, and large soundboard area combine to provide an incredible dynamic range, with massive forte and a delicate pianissimo.